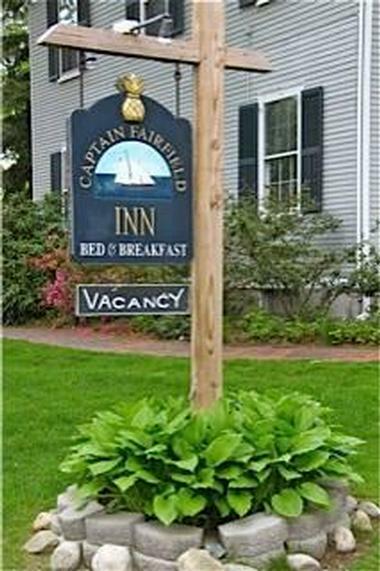 The Captain Fairfield Inn is a luxurious boutique bed and breakfast in the heart of Kennebunkport, Maine, that offers a beautiful blend of contemporary décor and style, creative cuisine and gracious, professional hospitality. Situated in a quiet neighborhood overlooking the River Green and just one block away from the Kennebunkport harbor and the bustling Dock Square, the Captain Fairfield Inn is surrounded by beautifully landscaped gardens and grounds cooled by sea breezes. 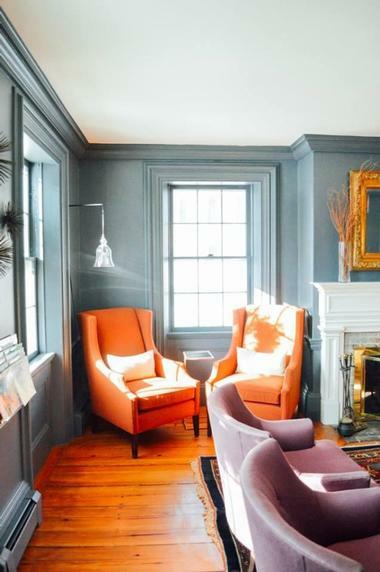 The charming hotel features nine inviting guest rooms designed to reflect the ambiance of the 1813 Federal mansion in which the hotel is based on a seamless blend of old world period décor and furnishings and new age modern amenities for the discerning travelers. 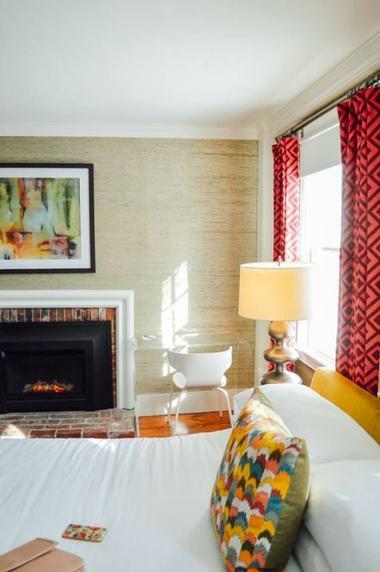 The Kennebunkport Inn features nine beautifully appointed guest rooms with bold contemporary décor, period furnishings, luxurious beds with pillow-top mattresses and luxury designer bed linens, and en-suite bathrooms with walk-in showers, plush towels, waffle kimono robes, and designer products. 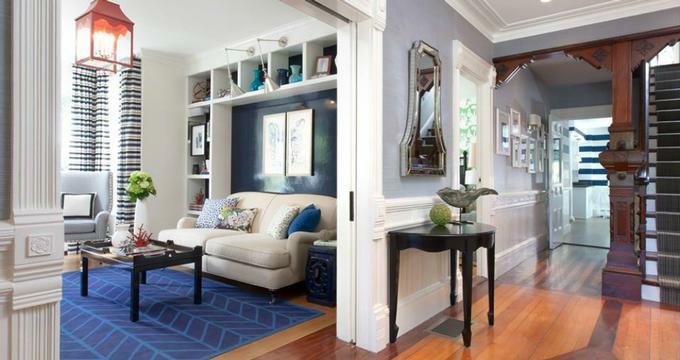 Some rooms feature extra amenities such as writing decks, gas fireplaces, rainfall showers, soaking tubs, and private porches with lovely garden views. Modern amenities in every room include flat screen TV/DVDs with Apple TV, iPads, iPod docking stations, air-conditioning, and complimentary wireless Internet. Additional room amenities include wine glasses, corkscrews, hairdryers, and irons and ironing boards. The Lark Suite is the largest guest room and features a king-size bed with pillow-top mattresses and luxury designer bed linens, and an en-suite bathroom with single vanity, oversized soaking tub inside the shower enclosure, plush towels, waffle kimono robes, and designer products. The Lark Suite boasts beautiful views of the historic River Green and modern amenities include HDTV, iPod docking station, air-conditioning, gas fireplace, and complimentary wireless Internet access. The James Suite is located on the second floor and features a distressed wood two-poster king-size bed with pillow-top mattresses and luxury designer bed linens, and an en-suite bathroom with single vanity, oversized soaking tub and shower, plush towels, waffle kimono robes, and designer bath products. Modern amenities include HDTV, iPod docking station, air-conditioning, gas fireplace, and complimentary wireless Internet access. The luxurious Vineyards Suite is located on the first floor and features a king-size bed with pillow-top mattresses and luxury designer bed linens, and an en-suite bathroom with single vanity, a double-head shower, plush towels, waffle kimono robes, and designer bath products. A small sitting room has two comfy chairs and sailing-inspired art, along with HDTV, iPod docking station, air-conditioning, gas fireplace, and complimentary wireless Internet access. The Sweet Liberty Room is a sunny and spacious corner room on the second floor with a grand upholstered queen-size bed with pillow-top mattresses and luxury designer bed linens, and an en-suite bathroom with single vanity, a luxurious tiled rainfall shower, plush towels, waffle kimono robes, and designer bath products. 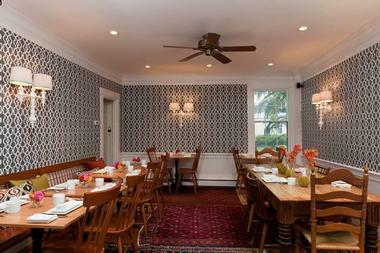 The Sweet Liberty Room boasts views of the neighborhood’s historic sea captain’s homes and the River Green. The Captain Fairfield Room is a large second-floor corner room overlooking Kennebunkport’s Village Green park with a king-size bed with pillow-top mattresses and luxury designer bed linens, and an en-suite bathroom with single vanity, a walk-in shower, and soaking tub, plush towels, waffle kimono robes, and designer bath products. A sitting area has a large comfortable couch, and wide plank pine floors covered with a bold modern rug and modern amenities include HDTV, iPod docking station, air-conditioning, gas fireplace, and complimentary wireless Internet access. The Walker Room is located on the second-floor corner and features a plush king-size bed with pillow-top mattresses and luxury designer bed linens, and an en-suite bathroom with single vanity, a walk-in shower and soaking tub, plush towels, waffle kimono robes, and designer bath products. Decorated in soothing tones of red, blue and tan, this room has a comfortable sitting area with an overstuffed couch, writing desk, modern corner fireplace, and dressing room and modern amenities include HDTV, iPod docking station, air-conditioning, gas fireplace, and complimentary wireless Internet access. The Rachel Room is located at the back of the house on the second floor and features a plush king-size bed with pillow-top mattresses and luxury designer bed linens, and an en-suite bathroom with single vanity, a walk-in shower and soaking tub, plush towels, waffle kimono robes, and designer bath products. This room has a comfortable sitting area with an overstuffed couch, writing desk, modern corner fireplace, and dressing room and modern amenities include HDTV, iPod docking station, air-conditioning, gas fireplace, and complimentary wireless Internet access. Inspired by colors of coastal sand and the jewel green of Maine waters, the Breakwater Room is located on the second floor and boasts a king-size bed with pillow-top mattresses and luxury designer bed linens, and an en-suite bathroom with single vanity, a walk-in shower and soaking tub, plush towels, waffle kimono robes, and designer bath products. A sitting area has a gas fireplace and plush suede chaise, and modern amenities include HDTV, iPod docking station, air-conditioning, gas fireplace, and complimentary wireless Internet access. The Parsons Room is located at the back of the house on the second floor and features a plush king-size bed with pillow-top mattresses and luxury designer bed linens, and an en-suite bathroom with single vanity, a walk-in shower and soaking tub, plush towels, waffle kimono robes, and designer bath products. This room has a comfortable sitting area with an overstuffed couch, writing desk, modern corner fireplace, and dressing room and modern amenities include HDTV, iPod docking station, air-conditioning, gas fireplace, and complimentary wireless Internet access. Guests are treated to a signature gourmet breakfast of curated small plates in the mornings and homemade cookies in the afternoon. This unique tapas-style breakfast features fresh fruit and juices, organic teas, and roasted coffee, along with plates such as oatmeal with coconut and currants, baked Portobello mushrooms, Mexican hot chocolate scones, and lemon-ginger scones. The Captain Fairfield Inn offers an array of amenities, including a signature gourmet breakfast of curated small plates in the mornings and homemade cookies in the afternoon, a 24-hour guest pantry offering beverages and snacks, and freshly baked chocolate chip cookies in the evening. Additional services include free wireless Internet throughout the Inn and grounds, daily newspapers and current magazines, a comfortable lounge with a wood burning fireplace and an outdoor lounge with fire-tables and private seating areas, and beautifully landscaped grounds and gardens. A DVD library and various board games and puzzles offer entertainment, and there are umbrellas for guests to use.